Go from boring to stylish! 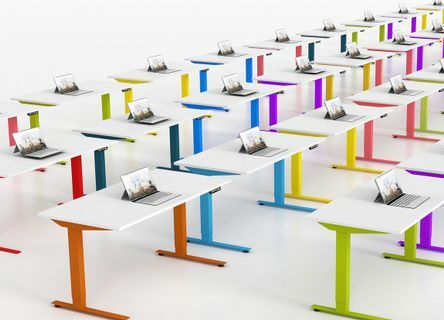 Price Point, Performance and Design…With our Height Adjustable Desks, you’ll be able to select any color for the metal base as well as any finish for the worksurface to meld with your interior finishes and Company brand. These Sit Stand Desks have numerous workspace applications from Private Offices to incorporating into Open Plan Workstation pods. Our “Beamless” table bases don’t obstruct the installation of keyboard trays and wire managers! Made in the USA. Not sold individually…must be a part of an office project.